Building resilence into the infrastructure is a major challenge facing city planners. JANE EMBURY, marketing director, Wrightstyle*, discusses the role of glazing systems in offering protection to buildings and structures in a growing urbanised world. We are increasingly living and working in them. But how safe are our cities, and what does the future hold for them and us? According to the United Nations (UN), more than half of the world’s population lives in urban areas and, by 2050, about 70 per cent of the world’s population is expected to live in towns and cities. The current level of urbanisation ranges from 82 per cent of the population in North America to 40 per cent in Africa, according to the Economist Intelligence Unit, in its Safe Cities Index 2015. Every day, over 187,000 people become city dwellers, posing enormous challenges to basic infrastructure such as water, sanitation and transport. The urban trend reflects both population and economic growth. In 1950, New York was the world’s first megacity, defined as having a population of more than 10 million people. Now there are more than 20 megacities and, by 2025, the populous US city is likely to have dropped to sixth on the list – behind Tokyo (Japan), Delhi (India), Shanghai (China), Mumbai (India), and Mexico City (Mexico). It’s an urban trend that, the Economist notes, is being repeated the world over. For example Lagos, the most populous city in Nigeria, is expected to double in size over the next 15 years. However, it’s not a trend that can be applied to every city, as the UN’s latest World Urbanisation Prospects study underlines. For example, Seoul, the capital of South Korea, has shrunk by 800,000 since 1990. There are also wide country-by-country variations. Bahrain and Australia have urbanisation rates of well over 80 per cent, while Bangladesh has a low rate of 34.3 per cent and Cambodia 20.7 per cent. However, the Economist report debunks the myth that population size and public safety are inexorably linked. New York, which had a homicide rate of 2,245 in 1990 – six murders a day – had a homicide rate of 335 in 2013, while piling in an addition one million inhabitants. But personal safety is only just one aspect of what makes a city “safe”. The Economist Intelligence Unit Safe Cities Index summaries the primary issues as being digital security, health security, infrastructure safety and personal safety. Stitching the index’s main findings together, the world’s most populous city, Tokyo, is also the safest – despite being in an earthquake zone. Unsurprisingly, cities in the developed world tend to be “safer” with those in the developing world less “safe”. That said, wealth is no guarantee of urban safety. Four out of five cities on the index in the Middle East, while considered high income, do not feature in the top half of the index. US cities come out well in digital security, with New York leading the way. Underlining the importance of technology, the report notes that the smartest cities use data to monitor the real world – for example, helping to prevent crime or the spread of disease. In North America, Toronto and New York come out top; in Europe, Stockholm and Amsterdam; in Asia, Tokyo and Singapore; and in the Middle East, Abu Dhabi (UAE) and Doha (Qatar). Baghdad is ranked as the riskiest city in the world. Two other Iraqi cities, Mosul and Ramadi, are second and third. Most cities classed as being at “extreme risk” are in the Middle East. However, it’s not enough simply to live in a statistically safe place. What’s important is how safe we actually feel – whether travelling on public transport or simply walking down a street at night. The challenge for cities globally is to address the myriad issues that do actually impact on public safety, while addressing the very real perceptions – or misconceptions – that a city’s population may have. It’s a Big Brother approach to urban safety that’s being driven by advances in “Big Data” – the ability of city authorities to harvest vast amounts of seemingly-unconnected information in real time from, among others, traffic management systems, utility companies and emergency services, and to predict where problems are likely to occur. All that has to be set against a backdrop of growing population size with all its negative impacts on infrastructure – and monitored against risk factors that may be wholly unpredictable: from natural disaster to terrorism, from civil unrest to criminality, and from economic downturn to pandemic. Urban safety is also about the design and layout of our streets, transport systems and the buildings in which we live and work. That design-led approach was given fresh impetus after 9/11, with greater imperative given to vertical escape routes (including lifts), more effective sprinkler systems, and better fire fighter access. Not least, around the world, it’s led to a better understanding of the importance of compartmentation – the ways in which fire, accidental or terrorism-related, can be contained at source and not allowed to spread unchecked to other parts of a building. It’s not just about the human cost of getting things wrong. Cities contribute up to 85 per cent of gross national product (GNP) in high-income countries, and generate a large proportion of government tax revenue. What happens in a major city can therefore have far-reaching consequences for everyone. Wrightstyle cannot do much about many of the things that go together to make a city safe. But what it can do is supply steel and aluminium glazing systems designed to resist the blast pressure of a lorry bomb or stop fire and toxic gases for up to two hours. We now live in a new urban age, with new complexities and an ever-shifting range of threats. Mitigating against those threats, and building resilience into city infrastructure, is perhaps the greatest challenge facing municipal authorities – and a challenge for everyone who works in the built environment. 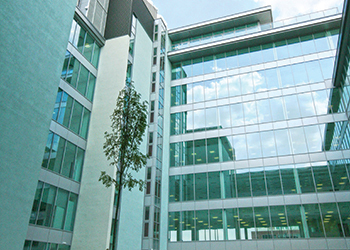 *Wrightstyle is one of Europe’s leading suppliers of advanced steel and aluminium glazing systems, supplying fire and blast resistant systems worldwide.